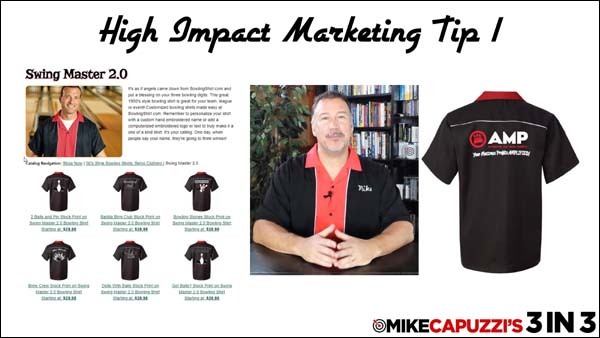 As you can see I’ve got my cool, vintage bowling shirt on because on this episode of 3 in 3, I want to focus on cool and hip ways you can create retro style marketing that stands out and gets attention. This is about tapping into nostalgia to get the attention of your target market. So, get ready for 3 in 3. If you ever want to have a unique theme for a tradeshow or event you are hosting and are looking for something fun and comfortable to wear, check out all the different retro bowling shirts at BowlingShirt.com. I have used this company and purchased the Swing Master 2.0 shirts for another business I am involved in for a trade show we attended. As you can see the shirt comes with my name stitched on the front and our logo on the back. It’s a great looking, super-comfortable shirt and I highly recommend BowlingShirt.com. Another simple way to create a fun, retro-look is with retro clipart. Retro-style clip art is an eye-catching way to make your marketing look fun and different! 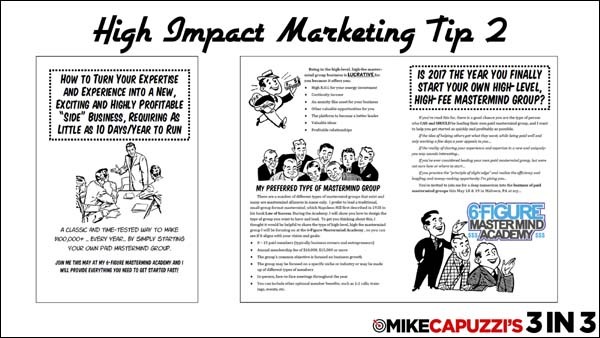 Last year I used a retro-style theme for a sales letter booklet I created for my 6-Figure Mastermind Academy. Throughout the booklet, I used these nostalgic graphics to illustrate the letter. I downloaded the various clipart from DepositPhoto.com, but you can also check out RetroClipArt.com and AndyNortnik.com for other retro clipart sources. 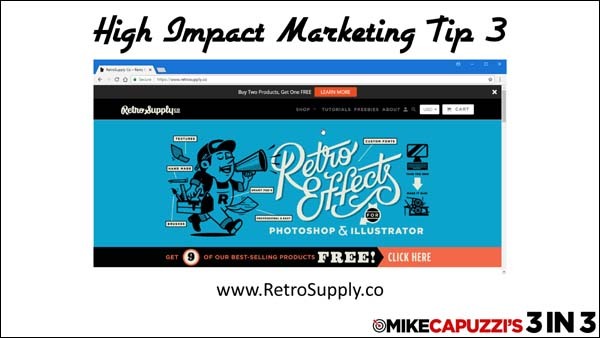 For the ultimate in simplicity and speed consider starting with retro Photoshop and Illustrator templates. These templates allow you or your designer to quickly and easily create attention-grabbing retro style graphics. RetroSupply.co has some very cool templates and such for designers to create all kinds of unique graphical designs. 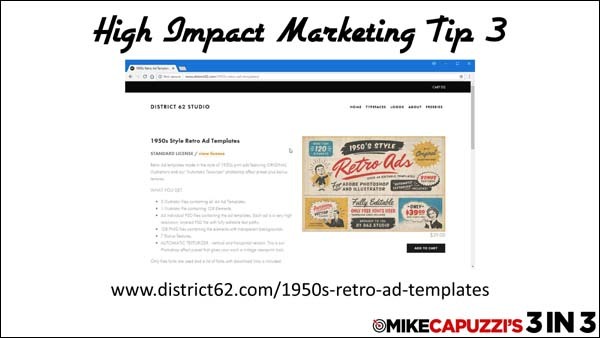 And if you want a neat little advertising template check out District 62 Studio’s 1950’s Style Retro Ad template. I can see using this for a fun postcard mailer. So that wraps up this hip and cool episode of 3 in 3. I hope you enjoyed it and were inspired to go retro with your next marketing campaign. Until next, cool cat keep on marketing! I'm a speaker, author and high impact marketing strategist for business owners and sharp, aggressive entrepreneurs looking to get to the next level in their business. I'm also the the inventor of the world-famous CopyDoodles. 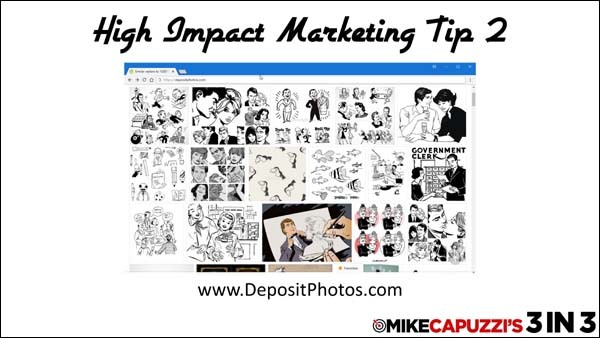 CopyDoodles are the world's largest library of handwritten fonts, hand-drawn doodles, comics and more designed to grab attention and boost your marketing results! Thanks for some really cool resources, Mike! Hey Doug – long time, no talk. Thanks!